Most English language readers or literary fiction don’t read literature in translation. It’s odd, but it’s true). I find that incredibly disappointing, particularly when one looks at lovers of crime fiction who react with absolute glee when new works appear in translation. Some writers leap over the great barrier of indifference. Most serious English-language readers could name a fair range of French and Russian writers without breaking sweat. German language would be trickier, but you might get a handful, the same could probably be said for Latin American writers (and I’ve just jumped there from a country to a continent of course). After that, after that I think most people would start to run a bit dry. That’s fair enough, we can’t read everything, but it does mean that most of us are missing out on absolute riches. Iceland has a strong literary tradition, but I wouldn’t call it a well known one. Italy of course, but few Italian writers are household names (Umberto Eco being the obvious exception). Japan has in my view one of the greatest bodies of literature the world has yet seen, but apart from Haruki Murakami I suspect most of it remains obscure even to those generally open to translated fiction. Then there”s Hungary. I’ve only reviewed two Hungarian novels so far on this blog (Antal Szerb’s The Pendragon Legend, translated by Len Rix; and Dezső Kosztolányi’s Skylark, translated by Richard Aczel). I own though a great deal more Hungarian literature that I haven’t read yet, and that looks absolutely superb. It looks so good in fact that I suspect Hungarian literature may be up there with French and Japanese in terms of the quality of the tradition. So, I’ve decided that I’m going to make September a personal Hungarian fiction reading month. All that means is that during September I’ll only be reading Hungarian literature, drawing on the titles I already own and haven’t got to yet. It’s not a challenge (how could reading great literature ever be that?) or a race, just an attempt to broaden my exposure to a body of work which I suspect I’ll find extremely rewarding. Now here’s the thing. I read around 50 books a year (I thought it was more, but blog stats don’t lie). That means I probably read around three to five novels a month, depending on how dense they are and how busy I am at work. That in turn means that I’m not going to get anywhere near reading all of that list. So it goes. Besides, having more than I can get to gives me a choice each time I finish a book of what to read next, which is important. I should also note that my reviews tend to lag my reading a book by a week or two on average. So, while I’ll only be reading books from the above list in September, my first couple of reviews in September will likely be of books finished during August, and my first couple of reviews in October will likely be the last couple of books I read during September. Those caveats are ok though, because the point of all this, to the extent there is any point beyond literary whim, is personal. I’ve bought these great books, I’ve sat them on my shelf and they remain there providing a certain literary ambience and helping insulate the dining room. Those are important tasks for books, but occasionally it’s nice to actually read them too. If nothing else it saves embarrassment if a guest picks one up and notices that the pages remain suspiciously pristine. If anyone wants to join me in this, that’s great. If not, I hope you find some of the resulting reviews interesting. Nice idea Max. I have Skylark, Sindbad by Kruly and 2 Krasznahorkais on the shelf. I’ve nearly started Satantango a couple of times so I’ll try to read that one next month as well. This is a great idea. I need to get to Satantango myself – I have read the other English Krasznahorkai books. The thought of reading more is somehow exhausting. The thing to do is plunge in. Plus more Kosztolányi after Skylark is obviously a must. Krudy sounds wonderful. Etc. etc. I don’t know when I will get to any of this, so I am interested to read about what you find. That’s a first! You don’t do challenges usually (even personal ones). It’s a great idea. 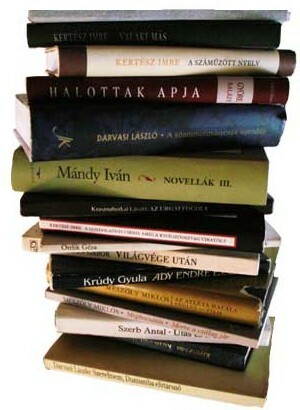 I’ve only read a few Hungarian books but I enjoyed them a lot. I have Anna Édes, I’ll try to read it along with you in September. Even if I don’t manage it, I’ll be happy to read your reviews. I have a Milán Füst at home (L’histoire d’une solitude), have you tried him before? I don’t have The Rebels but I have Les Confessions d’un bourgeois by Sándor Márai. According to the blurb, it sounds fabulous. Sorry, but I have no idea of the English titles of the two last ones I mentioned. Hooray for this. I owe my decision to start a blog almost entirely to my inability to contain my enthusiasm about the Miklós Bánffy trilogy (perhaps the best 19th century novel written in the 20th century, and that’s not to knock its 20th century aspects). I’ve also read Skylark, the Krudy Sindbad stories, a Szerb novel, and have Satantango, a Sándor Márai novel, and a bunch of other Hungarian works – including yet another giant trilogy, by Lajos Zihaly – on the shelf waiting to be read. Frigyes Karinthy is someone you might also want to add to your list. While the Bánffy was really my launch pad into Hungarian lit, I’ve been dazzled by the riches that still seem to lie in wait just among the works of Hungarian lit available in English. I greatly look forward to reading about your reading, and would be delighted to join in. Great idea Max. I don’t think I’ve read any Hungarian literature. Satantango has caught my eye, so I’ll aim to read it next month too. Looking forward to your reviews. Well, I thought I’d give The Pendragon Legend a go, as well as Metropole by Karinthy (shades of Kafka, Lem and Ajvaz). Thanks for the enthusiasm all. Leroy, I almost bought Sindbad but I already have an unread Krudy, so it’ll have to wait a bit. Skylark of course I loved. Tom, that means like you I do think more Kosztolanyi is a must. Emma, I know, I know, it’s because I never know what I’ll read next or how my moods will take me. Still, one should mix things up a little every now and then. Not only have I not read Milán Füst, I hadn’t heard of him either. I wonder if he’s translated into English (not that I plan to buy anything additional, I already have enough unread stuff which is partly what this is trying to address). Karlo, cool, comments will of course be welcome. Scott, you’re way ahead of me. I am delighted though to hear that the Banffy is that good. It’s unlike me these days to buy an entire trilogy without knowing more about them than I did when I got that. I’ll look at your blog for your reviews (or should I beware spoilers if those are relevant?). As I mentioned to Emma recently (to her surprise as I recall) I owe my blog to Victor Hugo’s Notre Dame de Paris. I wanted to talk about the architecture chapters and why you shouldn’t skip them. Jacqui, again, comments will be distinctly welcome. Also, both the ones I link to above are superb. Skylark is heartbreaking, and oddly enough mouth-watering in places. It’s an unusual combination. Tony, I don’t own it or perhaps, but I do fear you’re right and it would be less a Hungarian literature month and more a Peter Nadas couple of months. Steve,I think you’d really like The Pendragon legend actually. Very much a high quality shaggy dog tale. If you read Metropole do let me know what you think. I’ve never been quite sure whether to pick it up or not. I would also recommend Imre Kertesz’s Fiasco and his Kaddish for an Unborn Child. So so much better -, imaginative, engaging and profound – than the majority of the British contemporary novels. And of course Krasznahorkai is wonderful. Thanks Max. Skylark looks excellent I have to say. I’m going off on a bit of a tangent here, but your decision to focus on Hungarian literature during September has some parallels with an approach I’ve occasionally used to give more structure to my wine tasting (and drinking). It’s all too easy to stick with familiar grape varieties and regions I know I well. Selecting one or two less familiar regions is a great way of building on current experience and gaining a deeper understanding of the feel of a region – the winemakers and their approaches, the grape varieties, the terroir and how these influence the wine. I’ve used this approach to get to grips with Greek wines and to deepen my experience of the wines of New Zealand (several different regions / ‘genres’ here) and the cool-climate zones of Australia. Anyway, enough of my ramblings on wine…but if anyone would like a recommendation for Hungarian wine to accompany their reading, give me a shout. There are one or two good ones around, particularly sweet wines (Tokaji Aszu). Duly noted Vesna, and thank you. Jacqui, that makes a lot of sense. Also, by the time someone goes to all the trouble of exporting a wine from a country which is not a major producer in international terms, or translates a novel, the odds are they’ve done so because that wine or novel is a pretty good example of its type. If anything that’s truer of literature than wine, since there’s a market for cheap wine which can lead to stuff travelling that’s not so great. There’s not much market for mediocre books from countries most readers don’t already know well. Max, I’d say just go ahead and dive into They Were Counted before reading any more about it. If it ends up boring you or isn’t to your taste, then you can cruise over to read my justifications for having had a quite different response (I don’t think I spoil too much, but still…). Your list lacks women. I’d recommend The Door by Szabo Magda and cheating a bit, because she wrote in French, The Notebook, The Proof, The Third Lie by Kristof Agota. For Kertesz, you could try to squeeze in his wonderful novella The Union Jack. I wasn’t crazy about the one Szerb novel I read, and the same goes for the one Marai I read a few years ago. Loved Skylark and Anna Edes, though and I think I have a third novel by that author around here somewhere. Looking forward to your posts on these books. I’ve read several Hungarian books this year (only Santantango from your list) and really enjoyed them. I’m halfway through the recently translated release of Voyage to Kazohinia by Sándor Szathmári, so I’ll have something posted on it in a week or so. If you’re looking for some more ideas on books, Hungarian Literature Online provides some nice leads that might interest you. Yeah, where’s Peter Nadas?!? Seriously, it’s a great idea and I hope you enjoy it – you should with the authors on that list. Look forward to your take on the books. Guy, a month once spent flatsharing with a group of German students who kept quoting Monty Python to each other has left me with a regrettable case of Montyphobia. I’ll check out the sketch though. It’s not that I don’t think they were good, it’s the flashbacks. Scott, shall do. I’ll look forward to reading your thoughts though. marco, that’s an excellent point. I hadn’t planned to buy more, but I may make an exception given the gender imbalance. Thanks for the recommends. Stu, brilliant, thanks. That’s one of my wife’s favourite novels. Not everything can connect Guy, I’d be interested to hear what your third Kosztolanyi was though. Szerb in particular is a very particular writer. Dwight, your blog looks a bit of a treasure trove, and thanks for the link. I see you’ve read some Ernst Weiss, his Jarmila remains one of my favourites. Lee, my budget, my poor, poor budget. Have mercy on my poor budget! Actuallly it’s more a timing thing, plus I don’t presently own it. If I get to the Banffy that’ll take enough of the month, and I want to get back to Proust in October. I have more to read than I have time, but then don’t we all? Wonderful idea Max. I’m reading Santanago at the moment and will try to join you. (Though will probably be derailed by Not The Booker commitments.) Like others on this thread, I’d also recommend the lovely NYRB of The Adventures of Sindbad – http://www.nybooks.com/books/imprints/classics/the-adventures-of-sindbad/ – enchanting. That Krudy is very much on my radar Sam, but I already have an unread book by him and I try these days not to buy books by an author when I already have unread books by them at home. Satantango looks a definite winner. Extraordinary. The NTB generally throws up a genuinely good book by the end and some good ones along the way too, but then there’s this. It’s a great review from Sam there. Actually having to read that kind of thing must be terrible. The Banffy does look very good. Also, once you’re through the first the rest of the trilogy is much shorter, which I know is a bit of a vulgar observation but it does make it all a bit more manageable. I do have that first Banffy: the opening is wonderful (haven’t got round to reading the rest yet). Max: how about a Japanese month at some point? I could try and offer some simultaneity if that comes to pass, it would be amazing…Kawabata, Oe, Abe, Mishima, Soseki, Hino et al. I forgot Tanizaki. Shameful. I’m in, Tony’s in…come on……. Apologies to Scott for not commenting on your blog but I have troubles loading and commenting on your blog, but I wanted to thank you for the trilogy recommendation. For anyone interested, it is available as a kindle version and while you may not want to read it in that format if you have a choice, it’s a great way to read a long sample and see if you like it. Jarmila just went on the list to read–thanks! I need a short book after all the doorstops I’ve read lately (with many more to come). Looking forward to your posts on these books (and I Burn Paris afterwards). Dwight, there’s a review of I Burn Paris over at The Asylum (it’s in my blogroll). If you’ve not seen that it’s worth reading, the book looks amazing. All, a Japanese month would be great, but it won’t be October (or not for me anyway) as I have plans to get back to Proust and that’s my only real window for him (I’ve booked time off). Guy, I often have trouble commenting on blogger blogs too, I think that software is struggling these days. What a great idea. I’ve never done a reading challenge as such but I do like to organise my own reading into projects sometimes and always find it rewarding. This year, I’ve been picking up books from the free online Yale ‘The American Novel Since 1945’ course in between other reading. Really satisfying making the connections between the books and seeing how different writers tackle the same times, places and preoccupations. I like the thought of doing it with translated fiction. A few years ago I kept hearing that we didn’t read much translated fiction in the UK and made a point of including more in my reading. So glad I did because I have discovered some of my favourite books that way. I reckon your reviews will be a good resource for others who try doing this with translated Hungarian writers too. Looking forward to reading the reviews. I think Jacqui’s analogy with wine tasting is a good one – and I love that you can suggest accompanying wines from Hungary, Jacqui! Sadly, I’m allergic to wine so maybe I should pick literature from somewhere better known for its spirits… (knew I should have been sipping whisky while reading all that Scottish fiction). Marco, yes, Magda Szabo’s Door is very good. That kind of exploration is rather satisfying Eva, I quite agree. The connections and differing approaches can be fascinating. I’m picking up a copy of the Szabo, and it turns out I also have Faludy’s My Happy Days in Hell. I won’t get to all these though, I’ve more now than I could read in a month given work and so on. I’ve started Metropole and so far my experience is matching that of the narrator. It’s rather dull and frustrating. I’m hoping something happens soon. Clearly Steve the book is to be applauded for so skilfully matching reader experience to subject matter. It is tricky actually capturing boredom without being boring, frustration without being frustrated. Impressive when it’s pulled off, but impressive precisely because it’s so difficult to pull off. It seems from reading the reviews of others that I’m a small minority of people who didn’t get on with Metropole. I did finish it but it was a slog, and had I had anything else to read with me at the time, I probably wouldn’t have bothered. I think ,y main problem with the story is that I was never convinced by it. It takes on the trappings of realism without ever managing to be realistic. Perhaps alienation between the reader and the story is part of the game, as the character is alienated from his world but the first half in which the same nothing happens over and over again, with the same descriptions, bored me, in the way that a poorly told joke gains nothing in being explained. Well, I’ve had my suspicions of it to be honest. Alienation is a tricky game. Nabokov’s Pnin plays with annoying the reader, which is similarly tricky, but Nabokov is brilliant and pulls it off. Most writers will struggle with that sort of thing, even good ones. Sorry for not responding to your facebook message yet by the way, I’ll email you. Just a quick update. So far I’ve read Anna Edes and Oliver VII, both of which were tremendous, and I’m a good way into Life is Happy (which is a short story collection). Where I’ve run into a bit of a roadblock is with The Door, which came highly recommended (both here and on twitter, by people with good taste in literature) but which in all honesty I’m just finding terrible. I’m on page 90, is there a radical shift in tone because if not I’m minded to dump it, write my review based on what I read and then let people tell me where I went wrong/what I missed in the comments (which would be cool by the way, like most bloggers I’m actually pretty pleased when someone disagrees in the comments). Anyway, page 90, can’t stand it presently, any point in my continuing? Tom, never a need to apologise for not commenting. It’s always good when you do and you’re always welcome. It sounds completely incomprehensible. I may have to get it myself. Bloody hell Tom, that’s quite a find. I may have to get that myself. I’ve just finished reading ‘Skylark’. What a wonderful, if heartbreaking, novel. There is an undercurrent of suffering and sadness, but I liked Kosztolanyi’s use of contrast to bring light as well shade to the narrative. I loved the passages on food and drink – trips to the ‘King of Hungary’ restaurant and Father’s exploits with the Panthers. I think this one will stay with me for some time. Thanks for the recommendation Max. Anna Edes sounds like another one to add to my list..
Isn’t it just Jacqui? Yes, a tremendous use of contrast and the passages on food and drink are still with me. One of my favourites that one. I someone has a thing for romantic literature, Mór Jókai produced an enormous body of romantic novels, so if you’re into that kind of stuff (like I was at age 13) you should look for his books (the quality is pretty even, one just needs some patience). One which I haven’t had the determination to buy yet (it is big and guite expensive) is “Captivity” by György Spiró, it is said to be a great and important work. You’ve mentioned the novel Skylark by Dezső Kosztolányi. Fun fact: to most Hungarians he is more known for his poetry than his prose, even though his novel Anna Édes is compulsory reading in high school. But that is a completely different question, my English is not good enough to decide whether English translations of Hungarian poetry can carry all that the original lines carry (Hungarian is quite an uniqe-sounding language, and its rhythm is also very different from English) so I won’t suggest poems to read (although it sure is worth a try). Thank you very much! I’ll check which of them are available. I admit I’m not a reader of romances, I don’t have that gene. Szerb is as close as I get (and he’s not a romance writer of course). I had heard that Kosztolányi was first a poet, but I haven’t seen his stuff translated. Translation from languages like Hungarian, like Japanese or Chinese, presents peculiar difficulties for translators due to the fundamentally different sentence structures as you note, though George Szirtes is a poet as well as a translator so perhaps he’s done some. I should check. Hungarian lit month was great, Guy asked me if I’d got tired reading several Hungarian books in a row, and the honest answer is I could easily have kept going. There’s just a tremendous body of work to explore there, a really rich tradition (plus in English we benefit from the fact nobody translates the bad stuff). Yup, it definitely takes a lifetime to really “know” Hungarian literature. you can imagine what it is like for us Hungarians: of course we wish to know as much as possible about the literature of the world, but we also have to deal with our own. I mean it’s like when I read a book by say Paul Auster or anyone else not from Hungary (and what is more important: someone not writing in Hungarian) I feel a bit guilty because there are so few of us to keep the treasure “alive” and read. I’ve just checked Kosztolányi’s poetic magnum opus in English. It is not good, half of the good stuff is lost. Btw. there is a marvellous movie adaptation of one of the novels I suggested (The Fifth Seal by Ferenc Sánta) Tough stuff, and not only because the actors speak this weirdo language in it as the movie is subtitled. It is one of the very few exceptions when the movie is as good as the novel. As a Hungarian, I’m glad to see that our literature is welcome abroad. I’ve recently started to investigate Hungarian literature translated to English and I found out that Krasznahorkai is way more popular with English speakers/readers than he is in Hungary. So I’ll definitely read Sátántangó. i’ve just launched my blog! i hope you enjoy it.